The Paris Haute Couture Fashion Week spring 2015 has officially ended and we are in a day of mourning. The whole experience was spectacular, with each fashion house presenting a collection that was even more breathtaking than the last. Having Zuhair Murad as one of the final shows certainly ensured that we are currently going through withdrawals, craving more mesmerizing pieces meant to grace the bodies of the world’s richest and most famous, from their weddings to the red carpet. 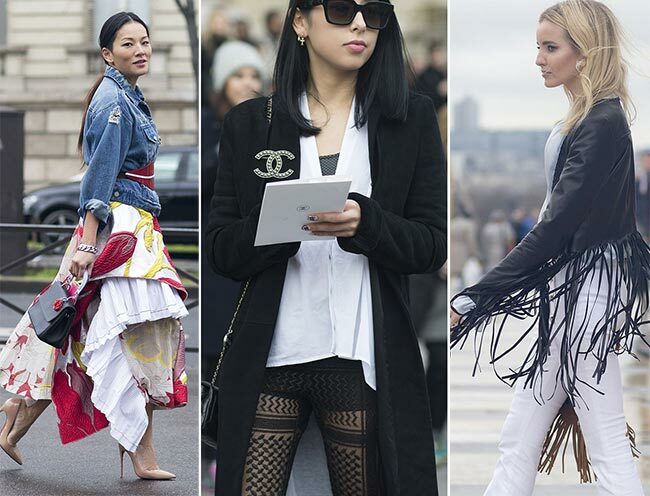 Furthermore, the guests coming in to the shows had their own street styles that we cannot ignore. As we stared at each show, glued to the screen, we came to realize that there were some fashion trends utilized by the attendants of the shows that really stuck out from among the rest, highlighting footwear, headwear and the types of materials used, along with the types of apparel that are “in’ for the spring and summer seasons of 2015. 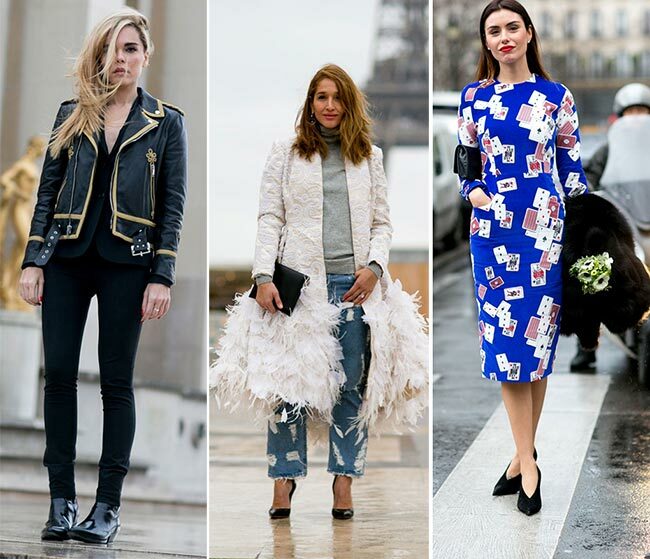 Here is what we discovered while looking through Pairs Haute Couture Fashion Week spring 2015 street style! From the handbags to the body hugging tube dresses, from darker colors to lighter spring designs, floral certainly has a predominant theme at Paris Fashion Shows. Sometimes not even prints, simple floral designs stuck out in black against a white background or delicate floral embroidery on puffed up lacy sweaters, flowers hold the power and bring the peace of spring along with them. Even leather jackets were given a floral print design, adding some zest to the black thick A-line puffed dress underneath. It appears as if some of the attendants came in with lovely furry coats, which reached the knees and were tied at the waist. One particular look with a very hairy fur coat included a green tulle sash at the waist, while the feet were clad in lovely white and grey sneakers and the handbag offered the greatest contrast with its crimson and dark hued body. We have fur in gorgeous gradient grey to white soft diagonally striped hues, worn over black and white midi dresses. Furry pompoms have also been spotted on strappy sandals worn under red fur coats, bringing a funkier look to the arena, while other don fur tripped crimson embroidered pashminas to protect the skin against the bite in the air. That furry black foxtail scarf certainly caught our attentions though, what with the dark blue stripes along the way. We’ve got tulle sashes tied around the waist as belts, along with golden tasselled ropes over wavy stitched rain jackets. We’ve seen felt hats that filled up the streets and protected perfectly coiffed hair from the rainy day. We even have matching sunglasses to it all. The hats were mostly black with some sporting a band in a lighter coloring. The belts were often tied if they were not matching the coats. It was a common trend on the catwalk among so many of the designers and it was common enough among the street style of the esteemed guests. Feathers appeared in different colors, from white to pinks, on handbags and coats, combined with silk and embroideries and all manner of designs. Some of the strangest looks in feathers were also seen, with feather trimming down the arms and across the hem of the sweaters. A common trend seen across the board was the use of black and white mixed prints and fabric designs. Some guests decided to grab white coats with black designs, while others wore dresses with white ruffles in front and a sleek black finish out back. In some striped coats, it was a gray and black instead of the white, but the pretty floral studded dress underneath was as crisp a contrast in color as possible. Black and white purses combined with a black and white tunic and pants set, complete with the furry chest, were also seen, let alone a fringed black jacket over a white blouse and trousers ensemble. Even furry striped tops boasted the black and white colour scheme. Plus, that black and white Chanel tweed pantsuit looked positively amazing! Whether it is the coat that reaches the knees or the dress underneath, midi hems were all the rage among the street styles clearly seen during the shows. That’s not to mention that miniskirts weren’t available wither, but that the majority of the hems covered most of the thighs and perhaps even the knees. Even the full A-line skirts with the longer backs are at a midi length. The cowgirls are in the house and seeing fringed jackets over a white blouse and trousers set definitely makes us happy. Fringes on handbags were also spotted, adding a touch of brock red to the blue-green colourings of the rest of the outfit. Mini hem skirt with fringes adding length to a midi look were coupled with button down shirts and lacy shoes, while others with their fringe at a shorter length and kept the mini look, while also adding the same thick fringe to a cashmere jacket. It was made pretty clear that embroidered designs and stitching in gems onto both ready-to-wear and haute couture pieces are all the rage at the moment. Whether it’s simpler creations or something more elaborately ornate, blazers with embroidery were seen both on and off the runway. The embroidery also makes it down to the hems of the midi skirts, creating colorful stitching as a band across the lower end. Golden embroidered designs on black looked amazing in the maxi length jacket worn over ankle length trousers and a crisp white shirt, giving the whole of the look a rather regal feel. There are a few guests, who opted to bring a bit of a casual feel to the feet by adding sneakers instead of boots or heels. In doing so, they turned the furry chic look into an intriguing combination of sporty chic, while grabbing a looser more ’70s hippie style look and adding a touch of urban fun. With the snows melting and the spring weather taking over, it appears that the white on white look is in and will be staying for a while. We’re talking white sweater or blouses with white jeans and straight pants, all the while adding beige and brown or black accessories to compliment the ensemble. The white on white also looked rather amazing with a touch of black as white shoes were combined with white culottes and topped off with a white mid length belted cashmere coat.